H. Goenner, J. Renn, J. Ritter, and T. Sauer (eds. ), The Expanding Worlds of General Relativity, Birkhäuser, 1999, 45–86. Emendations are indicated in red. The importance of the theory of relativity for twentieth-century physics, and the appearance of the Göttingen mathematician Hermann Minkowski at a turning point in its history have both attracted significant historical attention. This paper explores an important and unstudied aspect of Minkowski’s role in the history of the theory of relativity: his disciplinary advocacy. Minkowski’s 1908 Cologne lecture “Raum und Zeit” may be understood as an effort to extend the disciplinary frontier of mathematics to include the principle of relativity. I discuss the tension created by a mathematician’s intrusion into the specialized realm of theoretical physics, and Minkowski’s strategy to overcome disciplinary obstacles to the acceptance of his work. The effectiveness of his approach is evaluated with respect to a selection of responses, and related to trends in bibliometric data on disciplinary contributions to non-gravitational theories of relativity through 1915. 2.2 Why did Minkowski not mention Poincaré? 2.5 Did Minkowski understand Einstein’s concepts of relative time and simultaneity? The importance of the theory of relativity for twentieth-century physics, and the appearance of the Göttingen mathematician Hermann Minkowski at a turning point in its history have both attracted significant historical attention. The rapid growth in scientific and philosophical interest in the principle of relativity has been linked to the intervention of Minkowski by Tetu Hirosige, who identified Minkowski’s publications as the turning point for the theory of relativity, and gave him credit for having clarified its fundamental importance for all of physics (Hirosige 1968 , 46; 1976 , 78). Lewis Pyenson has placed Minkowski’s work in the context of a mathematical approach to physics popular in Göttingen, and attributed its success to the prevalence of belief in a neo-Leibnizian notion of pre-established harmony between pure mathematics and physics (Pyenson 1985 ; 1987 , 95). The novelty to physics of the aesthetic canon embodied in Minkowski’s theory was emphasized by Peter Galison ( 1979 ), and several scholars have clarified technical and epistemological aspects of Minkowski’s theory.11 1 On Minkowski’s role in the history of relativity see also Illy ( 1981 ) and Pyenson ( 1987 ). Many references to the primary and secondary literature on the theory of relativity may be found in Miller ( 1981 ) and Paty ( 1993 ). Pauli ( 1958 ) remains an excellent guide to the primary literature. In particular, the introduction of sophisticated mathematical techniques to theoretical physics by Minkowski and others is a theme illustrated by Christa Jungnickel and Russell McCormmach.22 2 McCormmach ( 1976 ); Jungnickel & McCormmach ( 1986b , 334–347). In what follows, we address another aspect of Minkowski’s role in the history of the theory of relativity: his disciplinary advocacy. Minkowski’s 1908 Cologne lecture “Raum und Zeit” (Minkowski 1909a ) may be understood as an effort to extend the disciplinary frontier of mathematics to include the principle of relativity. We discuss the tension created by a mathematician’s intrusion into the specialized realm of theoretical physics, and Minkowski’s strategy to overcome disciplinary obstacles to the acceptance of his work. The effectiveness of his approach is evaluated with respect to a selection of responses, and related to trends in bibliometric data on disciplinary contributions to non-gravitational theories of relativity through 1915. At the time of the meeting of the German Association in late September 1908, Minkowski was recognized as an authority on the theory of relativity nowhere outside of the university town of Göttingen. The structure and content of Minkowski’s lecture, we will see later, was in many ways a function of a perceived deficit of credibility. In order to understand this aspect of Minkowski’s lecture, we first examine how Minkowski became acquainted with the electrodynamics of moving bodies. Around 1907, Minkowski’s scientific reputation rested largely upon his contribution to number theory.33 3 Minkowski published his lectures on Diophantine analysis in Minkowski ( 1907a ). Yet Minkowski was also the author of an article on capillarity (Minkowski 1907b ) in the authoritative Encyklopädie der mathematischen Wissenschaften, granting him a credential in the domain of mechanics and mathematical physics. In addition, Minkowski had lectured on capillarity, potential theory, and analytical mechanics, along with mathematical subjects such as Analysis Situs and number theory at Zurich Polytechnic, where Einstein, Marcel Grossmann and Walter Ritz counted among his students; he also lectured on mechanics and electrodynamics (among other subjects) in Göttingen, where he held the third chair in mathematics, created for him at David Hilbert’s request in 1902.44 4 Copies of Minkowski’s manuscript notes of these lectures are in the Niels Bohr Library, Minkowski Papers, Boxes 7, 8 and 9. In Göttingen, Minkowski took an interest in a subject strongly associated with the work of many of his new colleagues: electron theory. An early manifestation of this interest was Minkowski’s co-direction of a seminar on the subject with his friend Hilbert, plus Gustav Herglotz and Emil Wiechert, which met during the summer semester of 1905.55 5 On the Göttingen electron theory seminar, see Pyenson ( 1985 , 102). 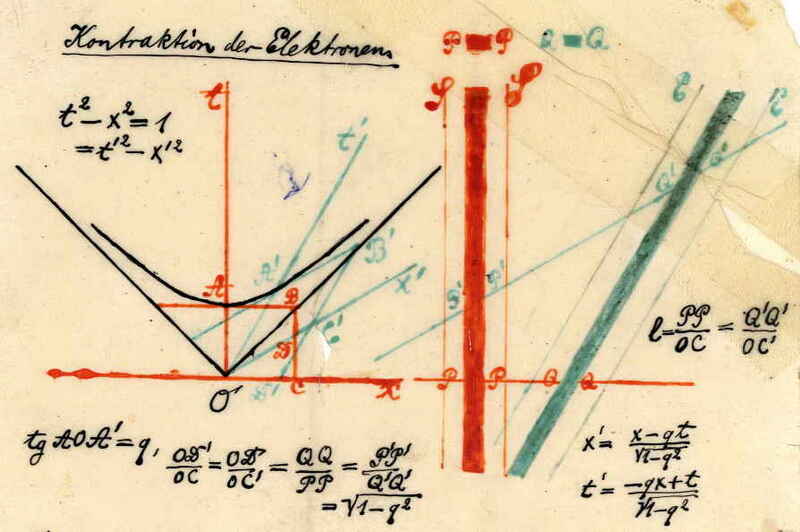 While Lorentz’s 1904 paper (with a form of the transformations now bearing his name) was not on the syllabus, and Einstein’s 1905 paper had not yet appeared, one of the students later recalled that Minkowski had hinted that he was engaged with the Lorentz transformations.66 6 Undated manuscript, Niedersächsische Staats- und Universitätsbibliothek, Nachlaß Hilbert 570/9; Born ( 1959 , 682). Minkowski was also busy with his article on capillarity, however, and for the next two years there is no trace of his engagement with the theory of relativity. In October 1907, Minkowski wrote to Einstein to request an offprint of his Annalen article on the electrodynamics of moving bodies, for use in his seminar on the partial differential equations of physics, jointly conducted by Hilbert.77 7 Minkowski to Einstein, 9 October 1907, in Klein et al., eds. ( 1993 , Doc. 62); course listing in Physikalische Zeitschrift 8 (1907): 712. Fragmentary notes by Hermann Mierendorff from this seminar show a discussion of Lorentz’s electrodynamics of moving media, see Niedersächsische Staats- und Universitätsbibliothek, Nachlaß Hilbert 570/5; Pyenson ( 1985 , 83). During the same semester, Minkowski introduced the principle of relativity into his lectures on the theory of functions (“Funktionentheorie.” Minkowski Papers: Box 9, Niels Bohr Library). During the following Easter vacation, he gave a short series of lectures on “New Ideas on the Basic Laws of Mechanics” for the benefit of science teachers.88 8 “Neuere Ideen über die Grundgesetze der Mechanik,” held in Göttingen from 21 April to 2 May, see L’Enseignement Mathématique 10 (1908): 179. In what seem to be notes to these holiday lectures, Einstein’s knowledge of mathematics was subject to criticism. Minkowski reminded his audience that he was qualified to make this evaluation, since Einstein had him to thank for his education in mathematics. From Zurich Polytechnic, Minkowski added, a complete knowledge of mathematics could not be obtained.99 9 Undated manuscript, Niedersächsische Staats- und Universitätsbibliothek, Math. Archiv 60: 4, 52. Minkowski’s uncharitable assessment of mathematics at Zurich Polytechnic belied the presence on the faculty of his friend Adolf Hurwitz, a member of the mathematical elite, and a lecturer of great repute. Graduates included Marcel Grossmann, L.-Gustave du Pasquier and Minkowski’s doctoral student Louis Kollros, all of whom were called upon to teach university mathematics upon completion of their studies. In recollections of his years as Einstein’s classmate, Kollros wrote that there was “almost too much mathematics” at Zürich Polytechnic (Kollros 1956 , 273). Minkowski’s remark that Einstein’s mathematical knowledge was incomplete may have been based on the fact that, unlike his classmates, Einstein did not elect to pursue graduate studies in mathematics, after obtaining the diploma from Polytechnic. This frank assessment of Einstein’s skills in mathematics, Minkowski explained, was meant to establish his right to evaluate Einstein’s work, since he did not know how much his authority carried with respect to “the validity of judgments in physical things,” which he wanted “now to submit.” A pattern was established here, in which Minkowski would first suggest that Einstein’s work was mathematically incomplete, and then call upon his authority in mathematics in order to validate his judgments in theoretical physics. While Minkowski implicitly recognized Einstein’s competence in questions of physics, he did not yet appreciate how much Europe’s leading physicists admired the work of his former student.1010 10 In a letter of 18 October 1908, Minkowski wrote to Robert Gnehm of his satisfaction in learning—during the Cologne meeting of scientists and physicians—how much Einstein’s work was admired by the likes of Walther Nernst, Max Planck and H. A. Lorentz (Seelig 1956 , 131–132). Even in his fief of Göttingen, Minkowski knew he could not expect any authority to be accorded to him in theoretical physics, yet this awareness of his own lack of credentials in physics did not prevent him from lecturing on the principle of relativity. While the scientific world had no real means of judging Minkowski’s competence in theoretical physics due to the paucity of relevant publications, Minkowski himself did not consider his knowledge in physics to be extensive. It is for this reason that he sought an assistant capable of advising him on physical matters, and when Max Born—a former student from the electron theory seminar—wrote him from Breslau (now Wrocław, Poland) for help with a technical problem, he found a suitable candidate. Initially attracted to mathematics, Born heard lectures by Leo Königsberger in Heidelberg, and Adolf Hurwitz in Zürich, and later considered Hurwitz’s private lectures as the high point of his student career. In Göttingen, Born obtained a coveted position as Hilbert’s private assistant, and began a doctoral dissertation on Bessel functions under Hilbert’s direction. When he abandoned the topic, as Born recalled in old age, Hilbert laughed and consoled him, saying he was much better in physics.1111 11 Transcript of an oral interview with Thomas S. Kuhn, 18 October 1962, Archives for History of Quantum Physics, p. 5. In the same year, Born attended Hilbert and Minkowski’s electron theory seminar, along with Max Laue and Jakob Laub, among others (Born 1959 , 682; Pyenson 1985 , 102). Profoundly influenced by what he learned in this seminar, and deeply devoted to both Hilbert and Minkowski, Born was not permitted to write a dissertation on electron theory, although the idea appealed to him (Born 1959 , 684). Felix Klein obliged him to write a dissertation on elasticity theory, but in order to avoid having “the great Felix” as an examiner, Born took up Karl Schwarzschild’s suggestion to prepare for the oral examination in astronomy (Born 1906 ; 1968 , 20–21). After defending his doctoral dissertation on 14 January 1907, Born spent six months in Cambridge with Joseph Larmor and J. J. Thomson before returning to Breslau, where the young theoretical physicists Stanislaus Loria and Fritz Reiche brought Einstein’s 1905 Annalen paper on relativity to his attention (Born 1959 , 684). In studying relativity with Reiche, as Born recounted later, he encountered some difficulties. He formulated these in a letter to Minkowski, seeking his former teacher’s advice. Minkowski’s response to Born’s letter was a great surprise, for instead of the requested technical assistance, Minkowski offered him the possibility of an academic career. Minkowski wrote that he had been working on the same problem as Born, and that he “would like to have a young collaborator who knew something of physics, and of optics in particular” (Born 1978 , 130).1212 12 According to another version, the manuscript sent to Minkowski showed a new way of calculating the electromagnetic mass of the electron, described by Born as a combination of “Einstein’s ideas with Minkowski’s mathematical methods” (Born 1968 , 25). Besides mathematics, Born had studied physics in Göttingen, attending Voigt’s “stimulating” lectures on optics and an advanced course on optical experimentation (Born 1968 , 21). It was just this background in optics that Minkowski lacked, and he looked to Born to guide him through unknown territory. In return, Minkowski promised Born he would open the doors to an academic career. The details were to be worked out when they met at the meeting of the German Association of Scientists and Physicians, later that year in Cologne (Born 1978 , 130).1313 13 Minkowski’s premature death prevented him from personally fulfilling his obligation to Born, but his Göttingen colleagues accorded Born the venia legendi in theoretical physics, on Voigt’s recommendation (Born 1978 , 136). In April 1908, Minkowski published a technically accomplished paper on the electromagnetic processes in moving bodies (“Die Grundgleichungen für die electromagnetischen Vorgänge in bewegten Körpern,” hereafter Grundgleichungen). In this essay, Minkowski wrote the empty-space field equations of relativistic electrodynamics in four-dimensional form, using Arthur Cayley’s matrix calculus. He also derived the equations of electrodynamics of moving media, and formulated the basis of a mechanics appropriate to four-dimensional space with an indefinite squared interval. Minkowski’s study represented the first elaboration of the principle of relativity by a mathematician in Germany. Soon after its publication, the Grundgleichungen sustained restrained comment from Minkowski’s former students Albert Einstein and Jakob Laub ( 1908b , 1908a ). These authors rejected out of hand the four-dimensional apparatus of Minkowski’s paper, the inclusion of which, they wrote, would have placed “rather great demands” on their readers (Einstein & Laub 1908b , 532). No other reaction to Minkowski’s work was published before the Cologne meeting. By the fall of 1908, Minkowski had spoken publicly of his views on relativity on several occasions, but never outside of Göttingen. The annual meeting of the German Association was Minkowski’s first opportunity to speak on relativity before an elite international audience of physicists, mathematicians, astronomers, chemists and engineers. At no other meeting could a scientist in Germany interact with other professionals working in disciplines outside of his own. The organization of the various disciplinary sections of the annual meeting of the German Association fell to the corresponding professional societies (Forman 1967 , 156). For example, the German Physical Society organized the physics section, and the German Society of Mathematicians managed the mathematics section. For the latter section, the theme of discussion was announced in late April by the society’s president, Felix Klein. In a call for papers, Klein encouraged authors to submit works especially in the area of mechanics. Prior to the announcement, however, Klein must have already arranged at least one contribution in mechanics, since he added a teaser, promising an “expert aspect” of a recent investigation in this area.1414 14 Jahresbericht der deutschen Mathematiker-Vereinigung 17 (1908): 61, dated 26 April 1908. It is tempting to identify this as a forward reference to Minkowski’s lecture, a draft of which predates Klein’s communication by a few days. The lecture was to be the first talk out of seven in the mathematics section, which doubled as a session of the German Society of Mathematicians.1515 15 Most of the lectures in the first section were published in volume 18 of the Jahresbericht der deutschen Mathematiker-Vereinigung. Shortly after the end of the First World War, the German Physical Society also held session at meetings of the German Association (see Forman 1967 , 156). The Göttingen archives contain four distinct manuscript drafts of Minkowski’s Cologne lecture, none of which corresponds precisely to either of the two printed versions of the lecture in the original German.1616 16 Niedersächsische Staats- und Universitätsbibliothek, Math. Arch. 60: 2 and 60: 4. An early draft is dated 24 April 1908 (60: 4, folder 1, p. 66. ); the other drafts are undated. Unless stipulated otherwise, we refer here to the longer essay published posthumously in both the Physikalische Zeitschrift and the Jahresbericht der deutschen Mathematiker-Vereinigung in early 1909. Gentlemen! The conceptions of space and time which I would like to develop before you arise from the soil of experimental physics. Therein lies their strength. Their tendency is radical. From this hour on, space by itself and time by itself are to sink fully into the shadows and only a kind of union of the two should yet preserve autonomy. The evocation of experimental physics was significant in the first sentence of Minkowski’s lecture, and it was deceptive. In what followed, Minkowski would refer to experimental physics only once, to invoke the null result of Albert A. Michelson’s optical experiment to detect motion with respect to the luminiferous ether. Otherwise, Minkowski kept his promise of a “rein mathematische” exposé, devoid of experimental considerations. A purely theoretical presentation enabled Minkowski to finesse the recent well-known experimental results purporting to disconfirm relativity theory, obtained by Walter Kaufmann.1818 18 The empirical adequacy of the “Lorentz-Einstein” theory had been challenged by Walter Kaufmann in 1905, on the basis of his measurements of the magnetic deflection of cathode rays (see Miller 1981 and Hon 1995 ). Two days after Minkowski’s lecture, Alfred Bucherer announced to the physical section the results of his deflection experiments, which contradicted those of Kaufmann and confirmed the expectations of the Lorentz-Einstein theory (Bucherer 1908 ). In the discussion of this lecture, Minkowski expressed joy in seeing the “monstrous” rigid electron hypothesis experimentally defeated in favor of the deformable electron of Lorentz’s theory (see Bucherer 1908 , 762). Less illusory than the mention of experimental physics was Minkowski’s announcement of a radical change in conceptions of space and time. That this revelation was local and immediate, is signaled by the phrase “from this hour on” [von Stund’ an]. Here it was announced that a union of space and time was to be revealed, and for the first time. This was a rhetorical gesture (all of the results presented in the Cologne lecture had been published in the Grundgleichungen), but it was an effective one, because the phrase in question became emblematic of the theory of relativity in broader circles. It may be noted from the outset that the claims Minkowski made for his theory fell into two categories. In one category were Minkowski’s claims for scientific priority, which concerned the physical, mathematical and philosophical aspects of his theory of relativity. In what follows, we will concentrate on the second category of claims, which were metatheoretical in nature. The latter claims concerned the theory’s type, not its constituent elements. Claims of the second sort, all having to do with the geometric nature of the theory, reinforced those of the first sort. The opening remarks provide an example: the allusion to changed ideas about space and time belongs to the first sort, while the claim of a purely mathematical development is of the second kind. Thus physical space, Minkowski pointed out, which one supposed to be at rest, could in fact be in uniform translatory motion; from physical phenomena no decision could be made concerning the state of rest (Minkowski 1909a , 77). Figure 1. Classical displacement diagram. After noting verbally the distinction between these two groups, Minkowski turned to the blackboard for a graphical demonstration. He drew a diagram to demonstrate that the above transformations allowed one to draw the time axis in any direction in the half-space t>0. While no trace has been found of Minkowski’s drawing, it may have resembled the one published later by Max Born and other expositors of the theory of relativity (see Figure 1).2020 20 Born 1922 , 60, fig. 41. A similar diagram appeared earlier in a work by Vito Volterra, who attributed it to a lecture given in Rome by Guido Castelnuovo (Volterra 1912 , 22, fig. 5). This was the occasion for Minkowski to introduce a spate of neologisms (Minkowski 1909a , 76–77): Weltpunkt, Weltlinie and Weltachse, as well as new definitions of the terms Substanz (‘something perceptible’), and Welt (the manifold of all conceivable points x, y, z, t). where c was an unspecified, positive-valued parameter (Minkowski 1909a , 77). Suppressing two dimensions in y and z, he then showed how this unit hypersurface might be used to construct a group of transformations Gc, once the arbitrary displacements of the zero point were associated with rotations about the origin. The figure obtained was introduced on a transparent slide, showing two pairs of symmetric axes.2121 21 Niedersächsische Staats- und Universitätsbibliothek, Math. Archiv 60: 2, courtesy of the Handschriftenabteilung. Minkowski’s hand-colored, transparent slide (10×15 cm) is reproduced here as Figure 2. Similar figures appear in Minkowski ( 1909a , 77). Figure 2. 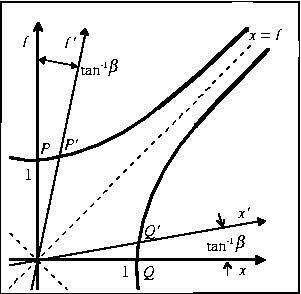 Minkowski’s space-time and length-contraction diagrams. In this way, the new space-time diagram collapsed into the old one, in a lovely graphic recovery of classical kinematics.2323 23 The elegance of Minkowski’s presentation of relativistic kinematics with respect to classical kinematics was admired and appreciated by many, including Max Planck, who may have been in the audience. See Planck ( 1910b , 42). Minkowski conceded that, in this instance, mathematics could only display wisdom after the fact, instead of a creative power of discovery. Again he stressed the mathematician’s distinct advantage over members of other scientific disciplines in seizing the deep consequences of the new theoretical view. Minkowski’s repetitive references to mathematicians and pure mathematics demand an explanation. Minkowski was a mathematician by training and profession. This fact is hardly obscure, but Minkowski’s reasons for stressing his point may not be immediately obvious. Two suggestions may be made here. In the first place, we believe that Minkowski and his contemporaries saw his work on relativity as an expansion of the disciplinary frontier of mathematics. Furthermore, this expansion was naturally regarded by some German physicists as imperialist, occurring at the expense of the nascent, growing sub-discipline of theoretical physics.2626 26 The entry of mathematicians into the field of relativity was described by Einstein as an invasion, as Sommerfeld later recalled (Sommerfeld 1949 , 102). To counterbalance what he found “extraordinarily compelling” [ungemein Zwingendes] in Minkowski’s theory, Wien stressed the importance to the physicist of experimental results, in contrast to the “aesthetic factors” that guided the mathematician (Wien 1909 , 39). On the emergence of theoretical physics in Germany, see Stichweh ( 1984 ); Jungnickel & McCormmach ( 1986a , 1986b ); Olesko ( 1991 ). The term “disciplinary frontier” is borrowed from Rudolf Stichweh’s writings. A desire to extend mathematical dominion over the newly-discovered region of relativistic physics would explain why Minkowski chose neither to describe his work as theoretical physics, nor to present himself as a theoretical (or mathematical) physicist. Secondly, in relation to this, we want to suggest that Minkowski was aware of the confusion that his ideas were likely to engender in the minds of certain members of his audience. In effect, Minkowski’s response to this expected confusion was to reassure his audience, by constantly reaffirming what they already knew to be true: he, Minkowski, was a mathematician.2727 27 This is further suggested by the sociologist Erving Goffman’s analysis of the presentation of self. Goffman noted that individuals present a different “face” to different audiences. The audience reserves the right to take the individual at his occupational face value, seeing in this a way to save time and emotional energy. According to Goffman, even if an individual were to try to break out of his occupational role, audiences would often prevent such action (see Goffman ( 1959 , 57). Minkowski’s wide reputation and unquestioned authority in pure mathematics created a tension, which is manifest throughout his writings on relativity. As long as Minkowski signed his work as a mathematician, any theory he produced lacked the “authenticity” of a theory advanced by a theoretical physicist. No “guarantee” of physical relevance was attached to his work—on the contrary. With very few exceptions (the article on capillarity, for example), nothing Minkowski had published was relevant to physics. Acutely aware of the cross-disciplinary tension created by his excursion into theoretical physics, Minkowski made two moves toward its alleviation. The first of these was to assert, at the outset of the lecture, that the basis of his theory was in experimental physics. The second was to display the physico-theoretical pedigree of the principle of relativity, aspects of which had been developed by the paragon of theoretical physicists, H. A. Lorentz, and by the lesser-known patent clerk and newly-named lecturer in theoretical physics in Bern, Albert Einstein. For anyone who might have objected that others had already pointed this out, Minkowski offered an interpretation of his theory on the space-time diagram.3030 30 Neither Einstein, nor Lorentz, nor Poincaré attended the Cologne meeting, although in late February Einstein wrote to Johannes Stark of his intention to do so (Einstein CP5: doc. 88). The emphasis on space was no accident, as Minkowski presented the notion of “endlessly many spaces” as his personal contribution, in analogy to Einstein’s concept of relative time. The grandiose announcement of the end of space and time served as a frame for the enunciation of Minkowski’s principle of relativity.3232 32 In Göttingen, Minkowski’s lofty assertions were the target of student humor, as witnessed by a student parody of the course guide, see Galison ( 1979 , 111, n. 69). Minkowski, whose lectures were said by Born ( 1959 , 682) to be punctuated by witty remarks, undoubtedly found this amusing. His sharp sense of humor is also evident in his correspondence with Hilbert (see Rüdenberg & Zassenhaus 1973 ). Rhetorical gestures such as this directed attention to Minkowski’s theory; its acceptance by the scientific community, however, may be seen to depend largely upon the presence of two elements: empirical adequacy, claimed by Minkowski at the opening of the lecture, and the perception of an advantage over existing theories. Minkowski went on to address in turn the work of two of his predecessors, Lorentz and Einstein. Before discussing Minkowski’s exposé of their work, however, we want to consider briefly the work of a third precursor, whose name was not mentioned at all in this lecture: Henri Poincaré. Widely acknowledged at the turn of the century as the world’s foremost mathematician, Henri Poincaré developed Lorentz’s theory of electrons to a state formally equivalent to the theory published at the same time by Einstein.3333 33 One sign of Poincaré’s mathematical preeminence was the Bólyai Prize, awarded him by a unanimous jury in 1905. For studies of Poincaré’s mathematical contributions to relativity theory see Cuvaj ( 1968 ) and Miller ( 1973 ). Poincaré’s critique of fin-de-siècle electrodynamics is discussed in Darrigol ( 1995 ). Poincaré and Einstein both recognized that the Lorentz transformations (so named by Poincaré) form a group; Poincaré alone exploited this knowledge in the search for invariants.3434 34 Poincaré proved that the Lorentz transformations form a group in a letter to Lorentz (reproduced in Miller ( 1980 ), and later pointed out to students the group nature of the parallel velocity transformations (see the notes by Henri Vergne of Poincaré’s 1906/7 lectures, Poincaré ( 1953 , 222). Among Poincaré’s insights relating to his introduction of a fourth imaginary coordinate in t⁢-1 (where c=1), was the recognition of a Lorentz transformation as a rotation about the origin in four-dimensional space, and the invariance of the sum of squares in this space, which he described as a measure of distance ( 1906 , 542). This analysis then formed the basis of his evaluation of the possibility of a Lorentz-covariant theory of gravitation. It is unlikely that the omission of Poincaré’s name was a simple oversight on Minkowski’s part. The printed version of Minkowski’s lecture, the corrected proofs of which were mailed only days before a fatal attack of appendicitis, was the result of careful attention in the months following the Cologne meeting.3535 35 On Minkowski’s labors see Hilbert ( 1910 , 469). This suggests that both the structure of the paper and the decision to include (or exclude) certain references were the result of deliberate choices on the part of the author. Following their appearance in this short history of the principle of relativity, the theoretical physicists Lorentz, Einstein and Max Planck all made it into Minkowski’s Cologne lecture, but the more mathematical Poincaré was left out. At least one theoretical physicist felt Minkowski’s exclusion of Poincaré in “Raum und Zeit” was unfair: Arnold Sommerfeld. In the notes he added to a 1913 reprint of this lecture, Sommerfeld attempted to right the wrong by making it clear that a Lorentz-covariant law of gravitation and the idea of a four-vector had both been proposed earlier by Poincaré. It is unknown if Poincaré ever received this letter. Like Sommerfeld, Mittag-Leffler and Fredholm reacted to the omission of Poincaré’s name from Minkowski’s lecture. The absence of Poincaré from Minkowski’s speech was remarked by leading scientists, but what did Poincaré think of this omission? His first response, in any case, was silence. In the lecture Poincaré delivered in Göttingen on the new mechanics in April 1909, he did not see fit to mention the names of Minkowski and Einstein (Poincaré 1910b ). Yet where his own engagement with the principle of relativity was concerned, Poincaré became more expansive. In Berlin the following year, for example, Poincaré dramatically announced that already back in 1874 (or 1875), while a student at the École polytechnique, he and a friend had experimentally confirmed the principle of relativity for optical phenomena (Poincaré 1910a , 104).3838 38 The experiment was designed to test the validity of the principle of relativity for the phenomenon of double refraction. The telling of this school anecdote may also be connected to Mittag-Leffler’s campaign to nominate Poincaré for the 1910 Nobel Prize for physics. Poincaré never mentioned the names of Einstein or Minkowski in print in relation to the theory of relativity, but during the course of this lecture, according to one witness, he mentioned Einstein’s work in this area (see Moszkowski 1920 , 15). Less than five years after its discovery, the theory of relativity’s prehistory was being revealed by Poincaré in a way that underlined its empirical foundations—in contradistinction to the Minkowskian version. If Poincaré expressed little enthusiasm for the new mechanics unleashed by the principle of relativity, and had doubts concerning its experimental underpinnings, he never disowned the principle.3939 39 In a lecture to the Saint Louis Congress in September 1904, Poincaré interpreted the “principe de relativité” with respect to Lorentz’s theory of electrons, distinguishing this extended relativity principle from the one employed in classical mechanics ( 1904 , 314). In the spring of 1912, Poincaré came to acknowledge the wide acceptance of a formulation of physical laws in four-dimensional (Minkowski) space-time, at the expense of the Lorentz-Poincaré electron theory. His own preference remained with the latter alternative, which did not require an alteration of the concept of space (Poincaré ( 1912 , 170). In the absence of any clear indication why Minkowski left Poincaré out of his lecture, a speculation or two on his motivation may be entertained. If Minkowski had chosen to include some mention of Poincaré’s work, his own contribution may have appeared derivative. Also, Poincaré’s modification of Lorentz’s theory of electrons constituted yet another example of the cooperative role played by the mathematician in the elaboration of physical theory.4040 40 Willy Wien spelled out this role at the 1905 meeting of the German Society of Mathematicians in Meran. Wien suggested that “physics itself” required “more comprehensive cooperation” from mathematicians in order to solve its current problems, including those encountered in the theory of electrons (Wien 1906 , 42; McCormmach 1976 , xxix). While Poincaré’s work in optics and electricity was well received, and his approach emulated by some German physicists (see Darrigol 1993 , 223), mathematicians generally considered him their representative. Poincaré’s “more mathematical” study of Lorentz’s electron theory demonstrated the mathematician’s dependence upon the insights of the theoretical physicist, and as such, it did little to establish the independence of the physical and mathematical paths to the Lorentz group. The metatheoretical goal of establishing the essentially mathematical nature of the principle of relativity was no doubt more easily attained by neglecting Poincaré’s elaboration of this principle. Turning first to the work of Lorentz, Minkowski made another significant suppression. In the Grundgleichungen, Minkowski had adopted Poincaré’s suggestion to give Lorentz’s name to a group of transformations with respect to which Maxwell’s equations were covariant (Minkowski 1908 , 473), but in the Cologne lecture, this convention was dropped. Not once did Minkowski mention the “Lorentz” transformations, he referred instead to transformations of the group designated Gc. The reason for this suppression is unknown, but very probably is linked to Minkowski’s discovery of a precursor to Lorentz in the employment of the transformations. In 1887, the Göttingen professor of mathematical physics, Woldemar Voigt, published his proof that a certain transformation in x, y, z and t (which was formally equivalent to the one used by Lorentz) did not alter the fundamental differential equation for a light wave propagating in the free ether with velocity c (Voigt ( 1887 ). For Minkowski, this was an essential application of the law’s covariance with respect to the group Gc. Lorentz’s insight he considered to be of a more general nature: Lorentz would have attributed this covariance to all of optics (Minkowski ( 1909a , 80). By placing Voigt’s transformations at the origins of the principle of relativity, Minkowski not only undercut Poincaré’s attribution to Lorentz, he also emulated Hertz’s epigram (Maxwell’s theory is Maxwell’s system of equations), whose underlying logic could only reinforce his own metatheoretical claims. In addition, he showed courtesy toward his colleague Voigt, who was not displeased by the gesture.4141 41 In response to Minkowski’s attribution of the transformations to his 1887 paper, Voigt gently protested that he was concerned at that time with the elastic-solid ether theory of light, not the electromagnetic theory. At the same time, Voigt acknowledged that his paper contained some of the results later obtained from electromagnetic-field theory (see the discussion following Bucherer ( 1908 , 762). In honor of the tenth anniversary of the principle of relativity, the editors of Physikalische Zeitschrift, Voigt’s colleagues Peter Debye and Hermann Simon, decided to re-edit the 1887 paper, with additional notes by the author (Voigt ( 1915 ). Shortly afterwards, Lorentz generously conceded that the idea for the transformations might have come from Voigt (Lorentz ( 1916 , p198, n. 1p). Having dealt in this way with the origins of the group Gc, Minkowski went on to consider another Lorentzian insight: the contraction hypothesis. Using the space-time diagram, Minkowski showed how to interpret the hypothesis of longitudinal contraction of electrons in uniform translation (Figure 2, right). Reducing Lorentz’s electron to one spatial dimension, Minkowski showed two bars of unequal width, corresponding to two electrons: one at rest with respect to an unprimed system and one moving with relative velocity v, but at rest with respect to the primed system. When the moving electron was viewed from the unprimed system, it would appear shorter than an electron at rest in the same system, by a factor 1-v2/c2. Underlining the “fantastic” nature of the contraction hypothesis, obtained “purely as a gift from above,” Minkowski asserted the complete equivalence between Lorentz’s hypothesis and his new conception of space and time, while strongly suggesting that, by the latter, the former became “much more intelligible.” In sum, Minkowski held that his theory offered a better understanding of the contraction hypothesis than did Lorentz’s theory of electrons ( 1909a , 80).4242 42 Lorentz’s theory did not purport to explain the hypothetical contraction. Although he made no mention of this in the Cologne lecture, Minkowski pointed out in the Grundgleichungen that the (macroscopic) equations for moving dielectrics obtained from Lorentz’s electron theory did not respect the principle of relativity (Minkowski 1908 , 493). This interpretation of Einstein’s notion of time with respect to an electron was not one advanced by Einstein himself. We will return to it shortly; for now we observe only that Minkowski seemed to lend some importance to Einstein’s contribution, because he went on to refer to him as having deposed the concept of time as one proceeding unequivocally from phenomena.4444 44 “Damit war nun zunächst die Zeit als ein durch die Erscheinungen eindeutig festgelegter Begriff abgesetzt” (Minkowski 1909a , 81). Where Einstein had deposed the concept of time (and time alone, by implication), Minkowski claimed in a like manner to have overthrown the concept of space, as Galison has justly noted (Galison 1979 , 113). Furthermore, Minkowski went so far as to suggest that his “additional step” was essential to a “correct understanding” of what he had presented as the core of relativity: the group Gc. He further implied that the theoretical physicists Lorentz and Einstein, lacking a “mathematical culture,” were one step short of the correct interpretation of the principle of relativity. According to Minkowski, Einstein clarified the physical significance of Lorentz’s theory, but did not grasp the true meaning and full implication of the principle of relativity. Minkowski marked his fidelity to the Göttingen electron-theoretical program, which was coextensive with the electromagnetic world picture. When Paul Ehrenfest asked Minkowski for a copy of the paper going by the title “On Einstein-Electrons,” Minkowski replied that when used in reference to the Grundgleichungen, this title was “somewhat freely chosen.” However, when applied to the planned sequels to the latter paper, he explained, this name would be “more correct.”4848 48 Minkowski to Paul Ehrenfest, 22 October 1908, Ehrenfest Papers, Museum Boerhaave, Leiden. Judging from the manuscripts in Minkowski’s Nachlaß (Niedersächsische Staats- und Universitätsbibliothek, Math. Archiv 60: 1), he had made little progress on Einstein-electrons before an attack of appendicitis put an end to his life in January 1909, only ten weeks after writing to Ehrenfest. An electron-theoretical derivation of the basic electromagnetic equations for moving media appeared under Minkowski’s name in 1910, but was actually written by Max Born (cf. Minkowski & Born, 1910 , 527). Ehrenfest’s nickname for the Grundgleichungen no doubt reminded Minkowski of a latent tendency among theoretical physicists to view his theory as a prolongation of Einstein’s work, and may have motivated him to provide justification of his claim to have proceeded beyond the work of Lorentz and Einstein. Did Minkowski offer a convincing argument for the superiority of his theory? The argument itself requires some clarification. According to Peter Galison’s reconstruction (Galison 1979 , 113), Minkowski “conjectures [that a] relativistically correct solution can be obtained” in one (spatial) dimension by rotating the temporal axis through a certain angle, leaving the x′-axis superimposed on the x-axis. Yet Minkowski did not suggest that this operation was either correct or incorrect. Rather, he claimed it was possible to interpret a previously-mentioned transformation in a way which was at odds with his own geometric interpretation. Proposed by Minkowski as Lorentz’s and Einstein’s view of space and time, such a reading was at the same time possible, and incompatible with Einstein’s presentations of the principle of relativity. The claim referred back to Minkowski’s exposé of both classical and relativistic kinematics by means of space-time diagrams. As mentioned above, he had emphasized the fact that in classical mechanics the time axis may be assigned any direction with respect to the fixed spatial axes x, y, z, in the region t>0. Minkowski’s specification of the “special transformation” referred in all likelihood to the special Lorentz transformations, in which case Minkowski’s further requirement of coincidence of the x⁢t and x′⁢t′ planes was (trivially) satisfied; the term is encountered nowhere else in the text. By singling out the physicists’ reliance on the special Lorentz transformation, Minkowski underlined his introduction of the inhomogeneous transformations, which accord no privilege to any single axis or origin.4949 49 See Minkowski ( 1908 , § 5; 1909a , 78). He then proposed that Lorentz and Einstein might have interpreted the special Lorentz transformation as a rotation of the t′-axis alone, the x′-axis remaining fixed to the x-axis. Since Minkowski presented two geometric models of kinematics in his lecture, we will refer to them in evaluating his view of Lorentz’s and Einstein’s kinematics. The first interpretation, and the most plausible one in the circumstances, refers to the representation of Galilean kinematics (see Figure 1). On a rectangular coordinate system in x and t, a t′-axis is drawn at an angle to the t-axis, and the x′-axis lies on the x-axis as required by Minkowski. Lorentz’s electron theory held that in inertial systems the laws of physics were covariant with respect to a Galilean transformation, x′=x-v⁢t.5050 50 The terminology of Galilean transformations was introduced by Philipp Frank ( 1908 , 898) in his analysis of the Grundgleichungen. In the x′⁢t′-system, the coordinates are oblique, and the relationship between t and t′ is fixed by Lorentz’s requirement of absolute simultaneity: t′=t. Where Poincaré and Einstein wrote the Lorentz transformation in one step, Lorentz used two, so that a Galilean transformation was combined with a second transformation containing the formula for local time.5151 51 Lorentz ( 1904 ) used the Galilean transformations separately from, and in conjunction with the following transformations (the notation is modified): x′=β⁢x, y′=y, z′=z, t=t/β-β⁢v⁢x/c2, where β=1/1-v2/c2. The second transformation did not lend itself to graphical representation, and had no physical meaning for Lorentz, who understood the transformed values as auxiliary quantities. The first stage of the two-dimensional Lorentz transformation was identical to that of classical mechanics, and may be represented in the same way, by rotating the time axis while leaving the position of the space axis unchanged. When realized on a Galilean space-time diagram, and in the context of Lorentz’s electron theory, Minkowski’s description of the special Lorentz transformations seems quite natural. On the other hand, as a description of Einstein’s kinematics it seems odd, because Einstein explicitly abandoned the use of the Galilean transformations in favor of the Lorentz transformations.5252 52 To suppose t equal to t′, Einstein commented later, was to make an “arbitrary hypothesis” (Einstein 1910 , 26). Lorentz’s theory of electrons provided for a constant propagation velocity of light in vacuo, when the velocity was measured in an inertial frame. However, this propagation velocity was not considered to be a universal invariant (as was maintained in the theories of both Einstein and Minkowski). In Lorentz’s theory of electrons, retention of classical kinematics (with the adjoining notion of absolute simultaneity) meant that the velocity of light in a uniformly translating frame of reference would in general depend on the frame’s velocity with respect to the ether. Measurements of light velocity performed by observers in these frames, however, would always reveal the same value, due to compensating dilatory effects of motion on the tools of measurement (Lorentz 1916 , 224–225). Einstein initially presented this equivalence as proof that his two postulates were compatible; later he recognized that the Lorentz transformations followed from this equivalence and a requirement of symmetry (Einstein 1905 , 901; 1907 , 419). At the same time, he made no further comment on the geometric significance of this invariance and maintained at least a semantic distinction between kinematics and geometry.5454 54 On Einstein’s reluctance to confound kinematics with geometry see his introduction of the terms “geometric shape” and “kinematic shape” to distinguish the forms of rigid bodies in a rest frame from those of rigid bodies in frames in uniform relative motion (Einstein 1907 , 417; Einstein 1910 , 28; Paty 1993 , 170). At the same time, Einstein’s recognition of the fundamental nature of the invariance of the quantity c2⁢t2-x2-y2-z2 can not be doubted; in 1907, for example, he used this invariance to simplify his derivation of the special Lorentz transformations ( 1907 , 419). Minkowski chose to fold one into the other, regarding c2⁢t2-x2-y2-z2 as a geometric invariant. Since y and z do not change in the case considered here, c2⁢t2-x2 is an invariant quantity when measured in an inertial system. Minkowski’s space-time diagram is a model of the geometry based on this metric. Following Minkowski’s interpretation of Einstein’s kinematics, the x′-axis (that which records the spatial distribution of events corresponding to c⁢t′=0) coincides with the x-axis. Recalling that the units of length and time for inertial systems were defined by Einstein in such a way that the quantity c2⁢t2-x2 was invariant for any two points, the position of the x′-axis with respect to the x-axis depended only upon the relative velocity of S′, manifest in the tilt angle of the c⁢t′-axis with respect to the c⁢t-axis (and vice-versa). Consequently, the requirement that the x′-axis coincide with the x-axis could not be met here, either, at least not without: (1) sacrificing one of Einstein’s postulates, (2) abandoning Einstein’s definition of time (and simultaneity), or (3) arbitrarily introducing an additional transformation in order to recover the special Lorentz transformation through composition. Neither one of the first two options would have been considered natural or plausible to one familiar with Einstein’s publications. As for the last option, since none of the properties of the Lorentz transformations are reflected geometrically, the operation is far from interpretative—it is pointless. It is also improbable that Minkowski would have attributed, even implicitly, the use of his space-time diagram to Lorentz or Einstein. For all these reasons, this reconstruction is far less plausible than the one considered previously. If either of these two reconstructions reflects accurately what Minkowski had in mind, the upshot is an assertion that Lorentz and Einstein subscribed to a definition of space and time at variance with the one proposed by Einstein in 1905. Ascribing the first (Galilean) interpretation to Lorentz was unlikely to raise any eyebrows. The second interpretation is inconsistent with Einstein’s presentation of relativistic kinematics. Furthermore, Minkowski imputed one interpretation (eine Deutung) to both Lorentz and Einstein.5555 55 A basis for this conflation was provided by Einstein in 1906, when he referred to the “Theorie von Lorentz und Einstein” (see the editorial note in Stachel et al., eds., 1989a , 372). Attentive to the distinction between Lorentz’s theory of electrons and Einstein’s theory of relativity, both Philipp Frank and Guido Castelnuovo rectified what they perceived to be Minkowski’s error, as we will see later in detail for Castelnuovo.5656 56 Frank ( 1910 , 494); Castelnuovo ( 1911 , 78). For later examples see Silberstein ( 1914 , 134) and Born ( 1922 , 178). Extreme discretion was exercised here, as none of these writers taxed Minkowski with error. On the other hand, Vito Volterra ( 1912 , 23) and Lothar Heffter ( 1912 , 4) adopted Minkowski’s view of Einstein’s kinematics, so it appears that no consensus was established on the cogency of Minkowski’s argument in the pre-war period. The confrontation of Einstein’s articles of 1905 and 1907, both cited by Minkowski, with the interpretation charged to Einstein (and Lorentz) by Minkowski, offers matter for reflection. Indeed, the justification offered by Minkowski for his claim would seem to support the view, held by more than one historian, that Minkowski, to put it bluntly, did not understand Einstein’s theory of relativity.5757 57 Many historians have suggested that Minkowski never fully understood Einstein’s theory of relativity, for example, Miller ( 1981 , 241), Goldberg ( 1984 , 193), Pyenson ( 1985 , 130). A detailed comparison of the theories of Einstein and Minkowski is called for, in order to evaluate Minkowski’s understanding of Einsteinian relativity; here we review only the way in which Einstein’s concepts of time and simultaneity were employed by both men up to 1908. These concepts are chosen for their bearing upon Minkowski’s unique graphic representation of Lorentz’s and Einstein’s kinematics. The relativity of simultaneity and clock synchronization via optical signals had been discussed by Poincaré as early as 1898, and several times thereafter (Poincaré 1898 ; 1904 , 311). As mentioned above, Lorentz’s theory of electrons did not admit the relativity of simultaneity; Lorentz himself used this concept to distinguish his theory from that of Einstein (Lorentz ( 1910 , 1236). Along with the postulation of the invariance of the velocity of light propagation in empty space and of the principle of relativity of the laws of physics for inertial frames of reference, Einstein’s 1905 Annalen article began with a definition of simultaneity ( 1905 , 891–893). He outlined a method for clock synchronization involving a pair of observers at rest, located at different points in space, denoted A and B, each with identical clocks. Noting that the time of an event at A may not be compared with the time of an event at B without some conventional definition of “time,” Einstein proposed that time be defined in such a way that the delay for light traveling from A to B has the same duration as when light travels from B to A. Essentially the same presentation of time and simultaneity was given by Einstein in his 1908 review paper, except in this instance he chose to refer to one-way light propagation ( 1907 , 416). In summary, by the time of the Cologne lecture, Einstein had defined clock synchronicity using both round-trip and one-way light travel between points in an inertial frame. Furthermore, we know for certain that Minkowski was familiar with both of Einstein’s papers. The formal equivalence of Einstein’s theory with that of Minkowski is not an issue, since Minkowski adopted unequivocally the validity of the Lorentz transformations, and stated just as clearly that the constant appearing therein was the velocity of propagation of light in empty space. The issue is Minkowski’s own knowledge of this equivalence, in other words, his recognition of either an intellectual debt to Einstein, or of the fact that he independently developed a partially or fully equivalent theory of relativity. In what follows, we examine some old and new evidence concerning Minkowski’s grasp of Einstein’s time concept. Insofar as meaning may be discerned from use, Minkowski’s use of the concepts of time and of simultaneity was equivalent to that of Einstein. In the Cologne lecture, for example, Minkowski demonstrated the relativity of simultaneity, employing for this purpose his space-time diagram ( 1909a , 83). A more detailed exposé of the concept—without the space-time diagram—had appeared in the Grundgleichungen. In the earlier paper, Minkowski examined the conditions under which the notion of simultaneity was well defined for a single frame of reference. His reasoning naturally supposed that the one-way light delay between two distinct points A and B was equal to the ordinary distance A⁢B divided by the velocity of light, exactly as Einstein had supposed. To conclude his discussion of the concept of time in the Grundgleichungen, Minkowski remarked by way of acknowledgment that Einstein had addressed the need to bring the nature of the Lorentz transformations physically closer ( 1908 , 487). Notwithstanding Minkowski’s demonstrated mastery of Einstein’s concepts of time and of simultaneity, his understanding of Einstein’s idea of time has been questioned. In particular, a phrase cited above from the Cologne lecture has attracted criticism, and is purported to be emblematic of Minkowski’s unsure grasp of the difference between Lorentz’s theory and Einstein’s (Miller ( 1981 , 241). In explaining how Einstein’s notion of time was different from the “local time” employed by Lorentz in his theory of electrons, Minkowski recognized the progress made by his former student, for whom “the time of one electron is just as good as that of the other.” In his 1905 relativity paper, Einstein referred, not to the time of one electron, but to the time associated with the origin of a system of coordinates in uniform translation, instantaneously at rest with respect to the velocity of an electron moving in an electromagnetic field ( 1905 , 917–918). Provided that such systems could be determined for different electrons, the time coordinates established in these systems would be related in Einstein’s theory by a Lorentz transformation. In this sense, Minkowski’s electronic interpretation of time was compatible with Einstein’s application of his theory to electron dynamics. Minkowski’s interpretation of Einstein’s time also reflects the conceptual change wrought in physics by his own notion of proper time (Eigenzeit). Near the end of 1907, Minkowski became aware of the need to introduce a coordinate-independent time parameter to his theory.5858 58 On Minkowski’s discovery of proper time, see Walter ( 1996 , 101). This recognition led him (in the appendix to the Grundgleichungen) to introduce proper time, which he presented as a generalization of Lorentz’s local time (Minkowski 1908 , 100). From a formal perspective, proper time was closely related to Einstein’s formula for time dilation.5959 59 Minkowski’s expression for proper time, ∫𝑑τ=∫𝑑t⁢1-v2/c2, may be compared with Einstein’s expression for time dilation, τ=t⁢1-v2/c2, although the contexts in which these formulae appeared were quite dissimilar (Einstein 1905 , 904; Miller 1981 , 271–272). The notation has been changed for ease of comparison. Minkowski may have simply conflated proper time with time dilation, since the “time of one electron” that Minkowski found in Einstein’s theory naturally referred in his view to the time parameter along the world-line of an electron, otherwise known as proper time. The introduction of proper time enabled Minkowski to develop the space-time formalism for Lorentz-covariant mechanics, which formed the basis for subsequent research in this area. In this way, proper time became firmly embedded in the Minkowskian view of world-lines in space-time, which Einstein also came to adopt several years later.6060 60 Einstein’s research notes indicate that he adopted a Riemannian space-time metric as the basis of his theory of gravitation in the summer of 1912; see the transcriptions and editorial notes in Klein et al., eds. ( 1995 ). For the uniformly moving electron, Lorentz had called the combination t′=(-q⁢x+t)/1-q2 the local time of the electron, and used this concept to understand the contraction hypothesis. Lorentz himself told me conversationally in Rome that it was to Einstein’s credit to have recognized that the time of one electron is just as good as that of the other, i.e., that t and t′ are equivalent. [Italics added]6161 61 “Lorentz hatte für das gleichförmig bewegte Elektron die Verbindung t′=(-q⁢x+t)/1-q2 Ortszeit des Elektrons genannt, und zum Verständnis der Kontraktionshypothese diesen Begriff verwandt. Lorentz selbst sagte mir gesprächsweise in Rom, dass die Zeit des einen Elektrons ebensogut wie die des anderen ist, d.h. die Gleichwertigkeit zu t und t′ erkannt zu haben, das Verdienst von Einstein ist.” (Undated manuscript, Niedersächsische Staats- und Universitätsbibliothek, Math. Archiv 60:4, 11) Minkowski’s story was corroborated in part by his student Louis Kollros, who recalled overhearing Lorentz and Minkowski’s conversation on relativity during a Sunday visit to the gardens of the Villa d’Este in Tivoli (Kollros ( 1956 , 276). According to Minkowski’s account, Lorentz employed the phrase in question to characterize Einstein’s new concept of time. In fact, what Lorentz had called local time was not the above expression, but t′=t/β-β⁢v⁢x/c2. When combined with a Galilean transformation, the latter expression is equivalent to the one Minkowski called Lorentz’s local time. Minkowski must have recognized his mistake, because in the final, printed version of “Raum und Zeit” he rewrote his definition of local time and suppressed the attribution of the italicized phrase to Lorentz. Based on the similarity of the treatment of simultaneity in the Grundgleichungen with that of Einstein’s writings, Minkowski’s acknowledgment of Einstein’s contribution in this area, his extension via proper time of Einstein’s relative time to the parameterization of world-lines, and the change he made to the definition of local time given in an earlier draft of the Cologne lecture, it appears that Minkowski understood Einstein’s concepts of time and simultaneity. This means, of course, that Minkowski’s graphic representation of Einstein’s kinematics was uncharitable at best. Minkowski may have perceived the success of his own formulation of relativity to depend in some way upon a demonstration that his theory was not just an elaboration of Einstein’s work. Likewise, some expedient was required in order for Minkowski to achieve the metatheoretical goal of demonstrating the superiority of pure mathematics over the intuitive methods of physicists; he found one in a space-time diagram. The diffusion of Minkowski’s lecture was exceptional. A few months after the Cologne meeting, it appeared in three different periodicals, and as a booklet. By the end of 1909, translations had appeared in Italian and French, the latter with the help of Max Born (Minkowski 1909a , 517, n. 1). The response to these publications was phenomenal, and has yet to be adequately measured. In this direction, we first present some bibliometric data on research in non-gravitational relativity theory, then discuss a few individual responses to Minkowski’s work. In order to situate Minkowski’s work in the publication history of the theory of relativity, we refer to our bibliometric analysis (Walter 1996 ). The temporal evolution in the number of articles published on non-gravitational relativity theory is shown in Figure 3, for West European-language journals worldwide from 1905 to 1915, along with the relative contribution of mathematicians, theoretical physicists, and non-theoretical physicists. These three groups accounted for nine out of ten papers published in this time period. Figure 3. Papers on the non-gravitational theory of relativity. The plot is based on 610 articles out of a total of 674 for all professions in the period from 1905 to 1915, inclusive. For details on sources and selection criteria, see chapter four of the author’s Ph.D. dissertation (Walter 1996 ). Starting in 1909, publication numbers increased rapidly until 1912, when the attention of theoretical physicists shifted to quantum theory and theories of gravitation. The annual publication total also declined then for non-theoretical physicists, but remained stable for mathematicians until the outbreak of war in 1914. A comparison of the relative strength of disciplinary involvement with the theory of relativity can be made for a large group of contributors, if we categorize individuals according to the discipline they professed in the university. Factoring in the size of the teaching staff in German universities in 1911, and taking into consideration only research published by certified teaching personnel (more than half of all authors in 1911 Germany), we find the greatest penetration of relativity theory among theoretical physicists, with one out of four contributing at least one paper on this subject (Table 1, col. 5). Professors of mathematics and of non-theoretical physics largely outnumbered professors of theoretical physics in German universities, and consequently, the penetration of relativity theory in the former fields was significantly lower than the ratio for theoretical physics. The number of contributors for each of the three groups was roughly equivalent, yet theoretical physicists wrote three papers for every one published by their counterparts in mathematics or non-theoretical physics (Table 1, col. 4). for university instructors in 1911 Germany. The relativist category is taken here to include critics of the special theory of relativity; physics is taken to include applied physics. The number of teaching positions is compiled from Auerbach & Rothe ( 1911b ). The initial response by Einstein and Laub to the Grundgleichungen, we mentioned earlier, dismissed the four-dimensional approach, and criticized Minkowski’s formula for ponderomotive force density. Others were more appreciative of Minkowski’s formalism, including the co-editors of the Annalen der Physik, Max Planck and Willy Wien. According to Planck and Wien, Minkowski had put Einstein’s theory in a very elegant mathematical form (Wien ( 1909 , 37); Planck ( 1910a , 110). In private, however, both men acknowledged a significant physical content to Minkowski’s work; in a letter to Hilbert, Wien expressed hope that these ideas would be “thoroughly worked out” (Wien to Hilbert, 15 April 1909, Nachlaß Hilbert 436, Niedersächsische Staats- und Universitätsbibliothek, Göttingen; Planck to Wien, 30 November 1909, Nachlaß Wien 38, Staatsbibliothek Preußissischer Kulturbesitz, Berlin). 1909b; Planck 1909). While Wien and Planck applauded Minkowski’s mathematical reformulation of the theory of relativity, they clearly rejected his metatheoretical views, and since their public evaluation came to dominate physical opinion of Minkowski’s theory, Minkowski’s effort in the Cologne lecture to disengage his work from that of Einstein must be viewed as a failure, at least as far as most physicists were concerned. Not all physicists agreed with Planck and Wien, however. The respected theorist Arnold Sommerfeld was the key exception to the rule of recognizing only Minkowski’s formal accomplishment. A former student of Hurwitz and Hilbert, and an ex-protégé of Felix Klein, Sommerfeld taught mathematics in Göttingen before being called to the Aachen chair in mechanics. In 1906, on the basis of his publications on diffraction and on electron theory, and upon Lorentz’s recommendation, he received a call to the chair in theoretical physics in Munich, where he was also to head a new institute.6262 62 See Eckert & Pricha ( 1984 ); Jungnickel & McCormmach ( 1986b , 274). Sommerfeld was among the first to champion Minkowskian relativity for both its physical and mathematical insights. The enthusiasm he showed for Minkowski’s theory contrasts with the skepticism with which he initially viewed Einstein’s theory. The latter held little appeal for Sommerfeld, who preferred the Göttingen lecturer Max Abraham’s rigid-sphere electron theory for its promise of a purely electromagnetic explanation of physical phenomena.6363 63 See the remarks made by Sommerfeld after a lecture by Planck ( 1906 , 761). In Munich Sommerfeld’s views began to change. The mathematical rigor of his papers on the rigid electron was subjected to harsh criticism by his former thesis advisor, now colleague, the professor of mathematics Ferdinand Lindemann. Vexed by these attacks, Sommerfeld finally suggested to Lindemann that the problems connected with time in electron theory were due not to its mathematical elaboration, but to its physical foundations (Sommerfeld 1907b , 281). Sommerfeld wrote a paper defending Einstein’s theory against an objection raised by Wien (Sommerfeld 1907a ), and in the summer of 1908, he exchanged correspondence with Minkowski concerning Einstein’s formula for ponderomotive force, and Minkowski’s description of the motion of a uniformly-accelerating electron (Minkowski 1908b).6464 64 In this letter, Minkowski extended an invitation to Sommerfeld to participate in a debate on electron theory to be held at the meeting of the Mathematical Society in Göttingen on the eighth of August. The nature of Sommerfeld’s immediate reaction to Minkowski’s lecture is unknown, although he was one of three members of the audience to respond during the discussion period, and the only physicist.6565 65 Along with the mathematicians Eduard Study and Friedrich Engel. Only Study’s remarks were recorded; see Verhandlungen der Gesellschaft Deutscher Naturforscher und Ärzte 80, Vol. 2, 9. After the meeting, he wrote to Lorentz to congratulate him on the success of his theory, for Alfred H. Bucherer had presented results of Becquerel-ray deflection experiments that favored the “Lorentz-Einstein” deformable-electron theory over the rigid-electron theory (Sommerfeld 1908). In another letter to Lorentz, a little over a year later, Sommerfeld announced, “Now I, too, have adapted to the relative theory; in particular, Minkowski’s systematic form and view facilitated my comprehension” (Sommerfeld to Lorentz, 9 January 19, Lorentz Papers 74: 4, Rijksarchief in Noord-Holland te Haarlem).6666 66 “Ich bin jetzt auch zur Relativtheorie bekehrt; besonders die systematische Form und Auffassung Minkowski’s hat mir das Verständnis erleichtert.” Both Bucherer’s experimental results and the Minkowskian theoretical view contributed to Sommerfeld’s adjustment to the theory of relativity, but the latter was what he found most convincing. In Sommerfeld’s first publications on Minkowski’s theory, he emphasized the geometric interpretation of the Lorentz transformations as a rotation in space-time; this was an aspect that also featured in lectures given in Munich during winter semester 1909/10.6767 67 Sommerfeld ( 1909b ); ( 1909a ); lecture notes entitled “Elektronentheorie,” Deutsches Museum, Nachlaß Sommerfeld; Archives for History of Quantum Physics, reel 22. He further enhanced the geometric view of relativity by deriving the velocity addition formula from spherical trigonometry with imaginary sides—a method that pointed the way to a reformulation of the theory of relativity in terms of hyperbolic trigonometry. Remarking that Einstein’s formula “loses all strangeness” in the Minkowskian interpretation, Sommerfeld maintained that his only goal in presenting this derivation was to show that the space-time view was a “useful guide” in special questions, in addition to facilitating development of the “relative theory” (Sommerfeld 1909b , 827, 829; Walter 1999 ). Sommerfeld naturally considered Minkowski’s view to be more geometric than Einstein’s theory; he found also that Einstein and Minkowski differed on what appeared to be substantial questions of physics. The prime example of this difference concerned the correct expression for ponderomotive force density. The covariant expression employed by Minkowski was presented by Sommerfeld as “closer to the principle of relativity” than Einstein and Laub’s formula (Sommerfeld 1909a , 815). Indeed, the latter formula was not Lorentz-covariant, but it had been proposed solely for a system at rest.6868 68 Einstein later wrote to Laub that he had persuaded Sommerfeld of the correctness of their formula (Einstein to Laub, 27 August 1910, Klein et al., eds., 1993 , Doc. 224). For a description of the physics involved, see Stachel et al. ( 1989b , 503). Debate on this question continued for several years, but by 1918, as Einstein candidly acknowledged to Walter Dällenbach, it had been known for a while that the formula he derived with Laub was wrong (Fölsing 1993 , 276). Sommerfeld depicted the technical difficulty inherent to Lorentz’s and Einstein’s theories as a thing of the past. Inasmuch as Minkowski appealed to mathematicians to study the theory of relativity in virtue of its essential mathematical nature, Sommerfeld encouraged physicists to take up Minkowski’s theory in virtue of its new-found technical simplicity. The pair of Annalen publications delivered Minkowskian relativity in a form more palatable to physicists, by replacing the unfamiliar matrix calculus with a four-dimensional vector notation. Similar vectorial reformulations of Minkowski’s work were published the same year by Max Abraham ( 1910 ) and Gilbert Newton Lewis ( 1910a , 1910b ). Apart from the change in notation, Sommerfeld’s presentation was wholly consonant with Minkowski’s reinterpretation of electron-theoretical results. He paraphrased, for example, Minkowski’s remark to the effect that, far from being rendered obsolete by his theory, the results for retarded potentials from (pre-Einsteinian) electron-theoretical papers by Liénard, Wiechert and Schwarzschild “first reveal their inner nature in four dimensions, in full simplicity” (Sommerfeld 1909a , 813).7070 70 “Enthüllen erst in vier Dimensionen ihr inneres Wesen voller Einfachheit” in a paraphrase of Minkowski ( 1909a , 88). On this theme see also Sommerfeld ( 1910b , 249–250). As mentioned above, Sommerfeld’s reputation in theoretical physics had been established on the basis of his publications on the rigid-electron theory, which for years had formed the basis of the electromagnetic world picture. The rigid electron had now been repudiated empirically by Bucherer’s results, but Minkowski felt it was still possible to pursue the electromagnetic world picture with ‘Einstein-electrons,’ as we saw above.7171 71 Poincaré had shown that the stability of Lorentz’s deformable electron required the introduction of a compensatory non-electromagnetic potential, producing what was later dubbed Poincaré pressure; for details, see Cuvaj ( 1968 ) and Miller ( 1973 , 300). Furthermore, this suggests that in supporting — unconditionally — Minkowski’s view of relativity, Sommerfeld did not “burn his boats,” as once thought (Kuhn et al., 1967 , 141). Instead, Sommerfeld’s active promotion and extension of Minkowski’s theory is best understood as an adaptation of the framework of the electromagnetic world picture to the principle of relativity.7272 72 For an example of Sommerfeld’s later fascination with the electromagnetic world picture, see Sommerfeld ( 1922 , chap. 1, § 2). An example of this adaptation may be seen in Sommerfeld’s redescription of a primary feature of the electromagnetic world picture: the ether. For those scientists still attached to the concept of ether (or absolute space, in Sommerfeld’s terminology), Sommerfeld proposed that they substitute Minkowski’s notion of the absolute world, in which the “absolute substrate” of electrodynamics was now to be found (Sommerfeld 1910a , 189). In this way, Minkowski and Sommerfeld filled the conceptual void created by Einstein’s brusque elimination of the ether. Sommerfeld’s mathematical background and close contacts with the Göttingen faculty distinguished him from other theoretical physicists, and enabled him to pass through the walls separating the mathematical and physical communities. In the direction of mathematics, Sommerfeld was a privileged interlocutor for Göttingen mathematicians. He shared their appreciation of the Lorentz transformation as a four-dimensional rotation; his derivation of the velocity addition theorem via spherical trigonometry stimulated dozens of publications by mathematicians in what became a mathematical sub-specialty: the non-Euclidean interpretation of relativity theory (Walter 1999 ). When David Hilbert needed an assistant in physics, he trusted Sommerfeld to find someone with the proper training.7373 73 According to Reid ( 1970 , 129), Sommerfeld sent his student P. P. Ewald to Hilbert in 1912. Hilbert felt that Sommerfeld’s view of theoretical physics could benefit research in Göttingen (including his own), and after Poincaré (1909), Lorentz (1910), and Michelson (1911), Sommerfeld received an invitation from the Wolfskehl Commission to give lectures on “recent questions in mathematical physics,” in the summer of 1912.7474 74 Nachrichten von der Königlichen Gesellschaft der Wissenschaften zu Göttingen, geschäftliche Mitteilungen (1910): 13, 117; (1913): 18; Born ( 1978 , 147). In the direction of physics, as we have mentioned, Sommerfeld rendered Minkowskian relativity comprehensible to physicists by introducing it in vector form. When chosen by the German Physical Society to deliver a report on the theory of relativity for the Karlsruhe meeting of the German Association in 1911, Sommerfeld announced that in the six years since Einstein’s publication, the theory had become the “secure property of physics” (Sommerfeld 1911 , 1057). His avowed enthusiasm for the theory, made manifest in publications, lectures and personal contacts, was essential in making this statement ring true. At the same time, there were many relativists who were convinced that the theory of relativity belonged to mathematics. Physicists typically rejected the Minkowskian view of the mathematical essence of the principle of relativity, but the message was heard in departments of mathematics around the world. Mathematicians were already familiar with the concepts and techniques from matrix calculus, hyperbolic geometry and group theory employed in Minkowski’s theory, and were usually able to grasp its unified structure with ease. As Hermann Weyl recalled in retrospect, relativity theory seemed revolutionary to physicists, but it had a pattern of ideas which made a perfect fit with those already a part of mathematics (Weyl 1949 , 541). Harry Bateman saw the the principle of relativity as unifying disparate branches of mathematics such as geometry, partial differential equations, generalized vector analysis, continuous groups of transformations, and differential and integral invariants (Bateman 1911 , 500). Mathematicians, from graduate students to full professors, some of whom had never made the least foray into physics, answered the call to study and develop the theory. According to our study (Walter 1996 , chap. 4), between 1909 and 1915, sixty-five mathematicians wrote 151 articles on non-gravitational relativity theory, or one out of every four articles published in this domain. In 1913, mathematicians publishing articles worldwide on the theory of relativity (22 individuals) outnumbered their counterparts in both theoretical (16) and non-theoretical (15) physics.7575 75 These figures are based on primary articles only, excluding book reviews and abstracts; for details, see the author’s Ph.D. dissertation (Walter 1996 , chap. 4). In addition to writing articles, some of these mathematicians introduced the theory of relativity to their research seminars, and taught its formal basis to an expanding student population eager to learn the “radical” theory of space-time. In Germany, according to the listings in the Physikalische Zeitschrift, out of thirty-nine regular course offerings on the theory of relativity up to 1915, eight were taught by mathematicians. This broad engagement with the theory of relativity ensured the institutional integration and intellectual propagation necessary to the survival of any research program. While the impetus for mathematical engagement with the theory of relativity had several sources, the practical advantages offered by the Minkowskian space-time formalism were probably decisive for many ‘relativist’ mathematicians, who almost invariably employed this formalism in their work. Minkowskian mathematicians made significant contributions in relativistic kinematics and mechanics, although their results were infrequently assimilated by physicists. A striking example of this failure to communicate was pointed out by Stachel ( 1995 , 278), with respect to Émile Borel’s 1913 discovery of Thomas precession. Perhaps more significant to the history of relativity than any isolated mathematical discovery was the introduction of a set of techniques and ideas to the practice of relativity by Minkowskian mathematicians. In favor of this standpoint we recall Stachel’s view ( 1989 , 55) of the role of the rigidly-rotating disk problem in the history of general relativity, and Pais’s conjecture ( 1982 , 216) that Born’s definition of the motion of a ’rigid’ body pointed the way to Einstein’s adoption (in 1912) of a Riemannian metric in the Entwurf theory of gravitation and general relativity. These are particular cases of a larger phenomenon; non-Euclidean and nonstatic geometries were infused into the theory of relativity from late 1909 to early 1913, as a by-product of studies of accelerated motion in space-time by the Minkowskians Max Born, Gustav Herglotz, Theodor Kaluza, Émile Borel and others (Walter 1996 , chap. 2). The clarion call to mathematicians did not come from Minkowski alone. Felix Klein quickly recognized the great potential of Minkowski’s approach, integrating Minkowski’s application of matrix calculus to the equations of electrodynamics into his lectures on elementary mathematics (Klein 1908 , 165). The executive committee of the German Society of Mathematicians, of which Klein was a member, chose geometric kinematics as one of the themes of the society’s next annual meeting in Salzburg, but Klein waited another year to give his own view of this subject.7676 76 On the research themes chosen by the German Society of Mathematicians and Klein’s role in promoting applied mathematics, see Tobies ( 1989 , 229). Developing his ideas before Göttingen mathematicians on 10 May, 1910, Klein pointed out that the new theory based on the Lorentz group (which he preferred to call “Invariantentheorie”) could have come from pure mathematics (Klein 1910 , 287). He felt that the new theory was anticipated by the ideas on geometry and groups that he had introduced in 1872, otherwise known as the Erlangen program (see Gray 1989 , 229). The latter connection was not one made by Minkowski, yet it tended to anchor the theory of relativity ever more solidly in the history of late nineteenth century mathematics (for Klein’s version see Klein 1927 , 28). The subdued response of the physics elite towards Minkowskian relativity constrasts with the enthusiasm displayed by Göttingen mathematicians. Of course, Minkowski’s sudden death just months after the Cologne meeting may have influenced early evaluations of his work. David Hilbert’s appreciation of Minkowski’s lecture, for example, was published as part of an obituary. In Hilbert’s account appeared nothing but full agreement with the views expressed by Minkowski, including the assessment of the contributions of Lorentz and Einstein. A few years later, Hilbert portrayed Einstein’s achievement as more fundamental than that of Minkowski, although this characterization appeared in a letter requesting financial support for visiting lecturers in theoretical physicists.7777 77 Hilbert to Professor H. A. Krüss, undated typescript, Niedersächsische Staats- und Universitätsbibliothek, Nachlaß Hilbert 494. Hilbert gave Einstein credit for having drawn the “full logical consequence” of the Einstein addition theorem, while the “definitive mathematical expression of Einstein’s idea” was left to Minkowski. See also Pyenson ( 1985 , 192). The axiomatic look of the theory presented by Minkowski in the Grundgleichungen was perfectly in line with Hilbert’s own aspirations for the mathematization of physics, which he had announced as number six in his famous list of worthy problems (Hilbert 1900 ; Rowe 1995 ; Corry 1997 ). In Hilbert’s view, Minkowski’s greatest positive result was not the discovery of the world postulate, but its application to the derivation of the basic electrodynamic equations for matter in motion (Hilbert 1910 , 465). Hilbert did not publish on the non-gravitational theory of relativity, but like Einstein, he borrowed Minkowski’s four-dimensional formalism for his work on the general theory of relativity in 1915 (Hilbert 1915 ). Minkowski’s theory of relativity was no doubt a prime example for Hilbert of the reconquest of physics by mathematicians. So far we have encountered the responses to Minkowski’s work by his Göttingen colleagues, who of course had a privileged acquaintance with his approach to electrodynamics. In this respect, most mathematicians were in a position closer to that of our third and final illustration of mathematical responses to the Cologne lecture, from Guido Castelnuovo. This case, however, is chosen primarily for its bearing on Minkowski’s interpretation of Einsteinian kinematics, and should not be taken as definitive of mathematical opinion of his work outside of Göttingen. In light of our earlier reconstruction of Minkowski’s argument, it would seem that Castelnuovo denied the possibility of the interpretation imputed to Einstein by Minkowski, in which a rotation of the temporal axis left the spatial axis unchanged; in Castelnuovo’s view, Einstein’s theory required that the temporal and spatial axes rotate together. From a disciplinary standpoint, it is remarkable that Castelnuovo claimed to be giving an authentic account of Minkowski’s view of Einstein’s kinematics. Despite his destruction of the basis to Minkowski’s priority claim, Castelnuovo acknowledged the cogency of his geometric approach, while recognizing the change in the concept of space brought about by Einsteinian relativity. 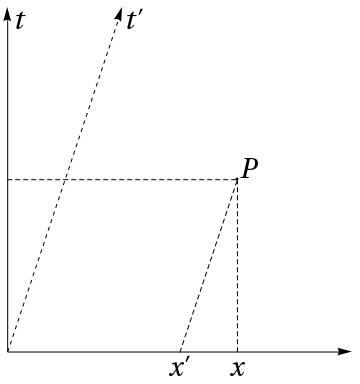 The perception of the aforementioned rotation of the spatial axes concomitant with a rotation of the temporal axis required either the adoption of Minkowski’s point of view, or the results of experimental physics. Of course, this was a paraphrase of Minkowski; we saw earlier how he conceded that the results of experimental physics had led to the discovery of the principle of relativity, and argued that pure mathematics could have done as well without Michelson’s experiment. For Castelnuovo, the acceptance of Minkowski’s metatheoretical view of the mathematical essence of the principle of relativity apparently did not conflict with a rejection of his theoretical claim on a new view of space. Minkowski’s semi-popular Cologne lecture was an audacious attempt, seconded by Göttingen mathematicians and their allies, to change the way scientists understood the principle of relativity. Henceforth, this principle lent itself to a geometric conception, in terms of the intersections of world-lines in space-time. Considered as a sales pitch to mathematicians, Minkowski’s speech appears to have been very effective, in light of the substantial post-1909 increase in mathematical familiarity with the theory of relativity. Minkowski’s lecture was also instrumental in attracting the attention of physicists to the principle of relativity. The Göttingen theorists Walter Ritz, Max Born and Max Abraham were the first to adopt Minkowski’s formalism, and following Sommerfeld’s intervention, the space-time theory seduced Max von Laue and eventually even Paul Ehrenfest, both of whom had strong ties to Göttingen. For a mathematician of Minkowski’s stature there was little glory to be had in dotting the i’s on the theory discovered by a mathematically unsophisticated, unknown, unchaired youngster. In choosing to publish his space-time theory, Minkowski put his personal reputation at stake, along with that of his university, whose identification with the effort to develop the electromagnetic world picture was well established. As a professor of mathematics in Göttingen, Minkowski engaged the reputation of German mathematics, if not that of mathematics in general. From both a personal and a disciplinary point of view, it was essential for Minkowski to show his work to be different from that of Lorentz and Einstein. At the same time, the continuity of his theory with those advanced by the theoretical physicists was required in order to overcome his lack of authority in physics. This tension led Minkowski to assimilate Einstein’s kinematics with those of Lorentz’s electron theory, contrary to his understanding of the difference between these two theories. Minkowski was ultimately unable to detach his theory from that of Einstein, because even if he convinced some mathematicians that his work stood alone, the space-time theory came to be understood by most German physicists as a purely formal development of Einstein’s theory. Einstein, too, seemed to share this view. It is well known that after unifying geometry and physics on electrodynamic foundations, Minkowski’s theory of space-time was instrumental to the geometrization of the gravitational field. In one of Einstein’s first presentations of the general theory of relativity, he wrote with some understatement that his discovery had been “greatly facilitated” by the form given to the special theory of relativity by Minkowski (Einstein ( 1916 , 769). The pronounced disciplinary character of this episode in the history of relativity is undoubtedly linked to institutional changes in physics and mathematics in the decades preceding the discovery of the theory of relativity. For some mathematicians, the dawn of the twentieth century was a time of conquest, or rather reconquest, of terrain occupied by specialists in theoretical physics in the latter part of the nineteenth century. In time, with the growing influence of this new sub-discipline, candidates for mathematical chairs were evaluated by theoretical physicists, and chairs of mathematics and mathematical physics were converted to chairs in theoretical physics. After a decade of vacancy, Minkowski’s chair in Zürich, for example, was accorded to Einstein.8181 81 Robert Gnehm to Einstein, 8 December 1911 (Einstein CP5: doc. 317). It seems that a critical shift took place in this period, as a new sense emerged for the role of mathematics in the construction of physical theories, which was reinforced by Einstein’s discovery of the field equations of general relativity. Mathematicians followed this movement closely, as Tullio Levi-Civita, Hermann Weyl, Élie Cartan, Jan Schouten and L. P. Eisenhart, among others, revived the tradition of seeking in the theories of physics new directions for their research. The relation between the Minkowski space-time diagram and the special Lorentz transformations is presented in many treatises on special relativity. One way of recovering the transformations from the diagram, recalling a method outlined by Max Laue ( 1911 , 47), proceeds as follows. On a Minkowski diagram (where the units are selected so that c=1) we draw the invariant curves ℓ2-x2=ℓ′⁣2-x′⁣2=±1 (see Figure 4). Figure 4. Minkowski diagram of systems S and S′. Invoking the property of symmetry, the transformations for x′ and t′ may be calculated in the same fashion as above, by starting with S′ instead of S.
For their critiques of preliminary versions of this paper, my warmest thanks go to Olivier Darrigol, Peter Galison, Christian Houzel, Arthur Miller, Michel Paty, Jim Ritter and John Stachel. The themes of this paper were presented in seminars at the University of Paris 7, at University College London, and at the 1995 HGR congress; I am grateful to their participants and organizers for stimulating discussions. Financial support was provided by a fellowship from the French Ministry of Research and Higher Education, and archival research was made possible by travel grants from the American Institute of Physics and the University of Paris 7. M. Abraham (1910) Sull’ elettrodinamica di Minkowski. Rendiconti del Circolo Matematico di Palermo 30, pp. 33–46. Cited by: §3.1. F. Auerbach and R. Rothe (Eds.) (1911a) Taschenbuch für Mathematiker und Physiker, 2. Jahrgang 1911. Teubner, Leipzig. Cited by: F. Auerbach and R. Rothe (1911b). F. Auerbach and R. Rothe (1911b) Verzeichnis der Hochschullehrer. See Taschenbuch für Mathematiker und Physiker, 2. Jahrgang 1911, Auerbach and Rothe , pp. 535. Cited by: §3. H. Bateman (1911) Mathematics and physics at the British Association, 1911. Nature 87, pp. 498–502. Cited by: §3.2. M. Born (1906) Untersuchungen über die Stabilität der elastischen Linie in Ebene und Raum, unter verschiedenen Grenzbedingungen. Ph.D. Thesis, Univ. of Göttingen, Göttingen. Cited by: §1. M. Born (1922) Die Relativitätstheorie Einsteins und ihre physikalischen Grundlagen. Springer, Berlin. External Links: Link Cited by: footnote 20, footnote 56. M. Born (1959) Erinnerungen an Hermann Minkowski zur 50. Wiederkehr seines Todestages. Naturwissenschaften 46 (17), pp. 501–505. Cited by: §1, footnote 32, footnote 6. M. Born (1968) My Life and My Views. Scribner’s, New York. Cited by: §1, §1, footnote 12. M. Born (1978) My Life: Recollections of a Nobel Laureate. Scribner’s Sons, New York. Cited by: §1, footnote 13, footnote 74. L. M. Brown, A. Pais, and B. Pippard (Eds.) (1995) Twentieth Century Physics. AIP Press, New York. Cited by: J. J. Stachel (1995). A. H. Bucherer (1908) Messungen an Becquerelstrahlen; die experimentelle Bestätigung der Lorentz-Einsteinschen Theorie. Berichte der Deutschen Physikalischen Gesellschaft 10, pp. 688–699. Cited by: footnote 18, footnote 41. J. Z. Buchwald (Ed.) (1995) Scientific Practice: Theories and Stories of Doing Physics. University of Chicago Press, Chicago. Cited by: G. Hon (1995). G. Castelnuovo (1911) Il principio di relatività e fenomeni ottica. Scientia (Rivista di Scienza) 9 (17), pp. 64–86. External Links: Link Cited by: §3.2, §3.2, footnote 56, footnote 80. Clark University Department of Physics (Ed.) (1912) Lectures Delivered at the Celebration of the 20th Anniversary of the Foundation of Clark University. Clark University, Worcester, Mass.. Cited by: V. Volterra (1912). L. Corry (1997) Hermann Minkowski and the postulate of relativity. Archive for History of Exact Sciences 51, pp. 273–314. Cited by: §3.2. C. Cuvaj (1968) Henri Poincaré’s mathematical contributions to relativity and the Poincaré stresses. American Journal of Physics 36, pp. 1102–1113. Cited by: footnote 33, footnote 71. O. Darrigol (1993) The electrodynamic revolution in Germany as documented by early German expositions of ‘Maxwell’s theory’. Archive for History of Exact Sciences 45, pp. 189–280. Cited by: footnote 40. O. Darrigol (1995) Henri Poincaré’s criticism of fin de siècle electrodynamics. Studies in History and Philosophy of Modern Physics 26, pp. 1–44. Cited by: footnote 33. M. Eckert and W. Pricha (1984) Boltzmann, Sommerfeld und die Berufungen auf die Lehrstühle für theoretische Physik in Wien und München 1890–1917. Mitteilungen der Österreichischen Gesellschaft für Geschichte der Naturwissenschaften 4, pp. 101–119. Cited by: footnote 62. A. Einstein and J. J. Laub (1908a) Die im elektromagnetischen Felde auf ruhende Körper ausgeübten ponderomotorischen Kräfte. Annalen der Physik 331, pp. 541–550. Cited by: §1. A. Einstein and J. J. Laub (1908b) Über die elektromagnetischen Grundgleichungen für bewegte Körper. Annalen der Physik 331, pp. 532–540. Cited by: §1. A. Einstein (1905) Zur Elektrodynamik bewegter Körper. Annalen der Physik 322, pp. 891–921. External Links: Link Cited by: §2.4, §2.5, §2.5, §3.1, footnote 59. A. Einstein (1907) Relativitätsprinzip und die aus demselben gezogenen Folgerungen. Jahrbuch der Radioaktivität und Elektronik 4, pp. 411–462. Cited by: §2.4, §2.5, footnote 54. A. Einstein (1910) Le principe de relativité et ses conséquences dans la physique moderne I. Archives des sciences physiques et naturelles 29, pp. 5–28. Cited by: footnote 52, footnote 54. A. Einstein (1916) Die Grundlage der allgemeinen Relativitätstheorie. Barth, Leipzig. Cited by: §4. A. Fölsing (1993) Albert Einstein. Suhrkamp, Frankfurt am Main. Cited by: footnote 68. P. Forman (1967) The Environment and Practice of Atomic Physics in Weimar Germany: A Study in the History of Science. Ph.D. Thesis, Univ. of California, Berkeley. Cited by: §1, footnote 15. P. G. Frank (1908) Das Relativitätsprinzip der Mechanik und die Gleichungen für die elektromagnetischen Vorgänge in bewegten Körpern. Annalen der Physik 332, pp. 897–902. Cited by: footnote 50. P. G. Frank (1910) Das Relativitätsprinzip und die Darstellung der physikalischen Erscheinungen im vierdimensionalen Raum. Zeitschrift für physikalische Chemie 74, pp. 466–495. Cited by: footnote 56. P. Galison (1979) Minkowski’s spacetime: from visual thinking to the absolute world. Historical Studies in the Physical Sciences 10, pp. 85–121. Cited by: §2.4, §2.4, Introduction, footnote 32. T. F. Glick (Ed.) (1987) The Comparative Reception of Relativity. Reidel, Dordrecht. Cited by: L. Pyenson (1987). E. Goffman (1959) The Presentation of Self in Everyday Life. Penguin, New York. Cited by: footnote 27. S. Goldberg (1984) Understanding Relativity. Birkhäuser, Basel. Cited by: footnote 57. J. Gray (1989) Ideas of Space: Euclidean, Non-Euclidean and Relativistic. Clarendon, Oxford. Cited by: §3.2. J. Gray (Ed.) (1999) The Symbolic Universe: Geometry and Physics, 1890–1930. Oxford University Press, Oxford. Cited by: S. A. Walter (1999). L. Heffter (1912) Zur Einführung der vierdimensionalen Welt Minkowskis. Jahresbericht der deutschen Mathematiker-Vereinigung 21, pp. 1–8. Cited by: §2.4. D. Hilbert (1900) Mathematische Probleme. Nachrichten von der Königlichen Gesellschaft der Wissenschaften zu Göttingen, mathematisch-physikalische Klasse, pp. 253–297. Cited by: §3.2. D. Hilbert (1910) Hermann Minkowski. Mathematische Annalen 68, pp. 445–471. Cited by: §3.2, footnote 35. D. Hilbert (1915) Die Grundlagen der Physik. (Erste Mitteilung.). Nachrichten von der Königlichen Gesellschaft der Wissenschaften zu Göttingen, mathematisch-physikalische Klasse, pp. 395–407. Cited by: §3.2. P. Hinneberg, E. Lecher, and E. Warburg (Eds.) (1915) Die Kultur der Gegenwart, Ihre Entwicklung und Ihre Ziele, 3, Mathematik - Naturwissenschaften - Medizin, 3, Anorganische Naturwissenschaften, 1: Physik. Teubner, Leipzig. External Links: Link Cited by: E. Wiechert (1915). T. Hirosige (1968) Theory of relativity and the ether. Japanese Studies in the History of Science 7, pp. 37–53. Cited by: Introduction. T. Hirosige (1976) The ether problem, the mechanistic worldview, and the origins of the theory of relativity. Historical Studies in the Physical Sciences 7, pp. 3–82. Cited by: Introduction. G. Hon (1995) Is the identification of experimental error contextually dependent? The case of Kaufmann’s experiment and its varied reception. See Scientific Practice: Theories and Stories of Doing Physics, Buchwald , pp. 170–223. Cited by: footnote 18. D. Howard and J. Stachel (Eds.) (1989) Einstein and the History of General Relativity. Birkhäuser, Boston. Cited by: J. J. Stachel (1989). J. Illy (1981) Revolutions in a revolution. Studies in History and Philosophy of Science 12, pp. 173–210. Cited by: footnote 1. C. Jungnickel and R. McCormmach (1986a) Intellectual Mastery of Nature: Theoretical Physics from Ohm to Einstein, Volume 1: The Torch of Mathematics, 1800–1870. University of Chicago Press, Chicago. Cited by: footnote 26. C. Jungnickel and R. McCormmach (1986b) Intellectual Mastery of Nature: Theoretical Physics from Ohm to Einstein, Volume 2: The Now Mighty Theoretical Physics, 1870–1925. University of Chicago Press, Chicago. Cited by: footnote 2, footnote 26, footnote 62. F. Klein (1908) Elementarmathematik vom höheren Standpunkt aus, Volume 1, Arithmetik, Algebra, Analysis. Teubner, Leipzig. External Links: Link Cited by: §3.2. F. Klein (1910) Über die geometrischen Grundlagen der Lorentzgruppe. Jahresbericht der deutschen Mathematiker-Vereinigung 19 (11), pp. 281–300. External Links: Link Cited by: §3.2. F. Klein (1927) Vorlesungen über die Entwicklung der Mathematik im 19. Jahrhundert, Volume 2. Julius Springer, Berlin. External Links: Link Cited by: §3.2. M. J. Klein, A. J. Kox, J. Renn, and R. Schulmann (Eds.) (1995) The Collected Papers of Albert Einstein, Volume 4, The Swiss Years: Writings, 1912–1914. Princeton University Press, Princeton. Cited by: footnote 60. M. J. Klein, A. J. Kox, and R. Schulmann (Eds.) (1993) The Collected Papers of Albert Einstein, Volume 5, The Swiss Years: Correspondence, 1902–1914. Princeton University Press, Princeton. Cited by: footnote 68, footnote 7. L. Kollros (1956) Albert Einstein en Suisse Souvenirs. See Jubilee of Relativity Theory, Mercier and Kervaire , Helvetica Physica Acta, Supplementum, Vol. 4, pp. 271–281. Cited by: footnote 61, footnote 9. T. S. Kuhn, J. L. Heilbron, P. Forman, and L. Allen (1967) Sources for History of Quantum Physics: An Inventory and Report. American Philosophical Society, Philadelphia. Cited by: §3.1. M. Laue (1911) Das Relativitätsprinzip. Vieweg, Braunschweig. External Links: Link Cited by: §5. G. N. Lewis (1910a) On four-dimensional vector analysis, and its application in electrical theory. Proceedings of the American Academy of Arts and Science 46, pp. 165–181. Cited by: §3.1. G. N. Lewis (1910b) Über vierdimensionale Vektoranalysis und deren Anwendung auf die Elektrizitätstheorie. Jahrbuch der Radioaktivität und Elektronik 7, pp. 329–347. Cited by: §3.1. H. A. Lorentz (1895) Versuch einen Theorie der elektrischen und optischen Erscheinungen in bewegten Körpern. Brill, Leiden. External Links: Link Cited by: §3.1. H. A. Lorentz (1904) Electromagnetic phenomena in a system moving with any velocity less than that of light. Proceedings of the Section of Sciences, Koninklijke Akademie van Wetenschappen te Amsterdam 6, pp. 809–831. External Links: Link Cited by: §1, §3.1, footnote 51. H. A. Lorentz (1910) Alte und neue Fragen der Physik. Physikalische Zeitschrift 11, pp. 1234–1257. Cited by: §2.5. H. A. Lorentz (1916) The Theory of Electrons and its Application to the Phenomena of Light and Radiant Heat. Teubner, Leipzig. Cited by: §2.4, footnote 41. R. McCormmach (1976) Editor’s forward. Historical Studies in the Physical Sciences 7, pp. xi–xxxv. Cited by: footnote 2, footnote 40. A. Mercier and M. Kervaire (Eds.) (1956) Jubilee of Relativity Theory. Birkhäuser, Basel. Cited by: L. Kollros (1956). A. I. Miller (1973) A study of Henri Poincaré’s ‘Sur la dynamique de l’électron’. Archive for History of Exact Sciences 10, pp. 207–328. Cited by: footnote 33, footnote 71. A. I. Miller (1980) On some other approaches to electrodynamics in 1905. See Some Strangeness in the Proportion, Woolf , pp. 66–91. Cited by: footnote 34. A. I. Miller (1981) Albert Einstein’s Special Theory of Relativity: Emergence (1905) and Early Interpretation. Addison-Wesley, Reading, MA. Cited by: §2.5, footnote 1, footnote 18, footnote 57, footnote 59. H. Minkowski and M. Born (1910) Eine Ableitung der Grundgleichungen für die elektromagnetischen Vorgänge in bewegten Körpern. Mathematische Annalen 68, pp. 526–551. Cited by: footnote 48. H. Minkowski (1907a) Diophantische Approximationen: Eine Einführung in die Zahlentheorie. Teubner, Leipzig. External Links: Link Cited by: footnote 3. H. Minkowski (1907b) Kapillarität. See Encyklopädie der mathematischen Wissenschaften mit Einschluss ihrer Anwendungen V, Physik, Volume 1, Sommerfeld , pp. 558–613. External Links: Link Cited by: §1. H. Minkowski (1908) Die Grundgleichungen für die electromagnetischen Vorgänge in bewegten Körpern. Nachrichten von der Königlichen Gesellschaft der Wissenschaften zu Göttingen, pp. 53–111. External Links: Link Cited by: §2.3, §2.5, §2.5, footnote 19, footnote 42, footnote 49. H. Minkowski (1909a) Raum und Zeit. Jahresbericht der deutschen Mathematiker-Vereinigung 18, pp. 75–88. External Links: Link Cited by: §2.1, §2.3, §2.3, §2.3, §2.4, §2.4, §2.5, §2, §2, §2, §2, §2, §2, §2, §3, Introduction, footnote 21, footnote 44, footnote 49, footnote 70. H. Minkowski (1909b) Spazio e Tempo. Nuovo Cimento 18, pp. 334–352. Cited by: footnote 25. A. Moszkowski (1920) Einstein: Einblicke in seine Gedankenwelt. Fontane/Hoffmann, Berlin/Hamburg. External Links: Link Cited by: footnote 38. K. M. Olesko (1991) Physics as a Calling: Discipline and Practice in the Königsberg Seminar for Physics. Cornell University Press, Ithaca. Cited by: footnote 26. A. Pais (1982) Subtle is the Lord …: The Science and the Life of Albert Einstein. Oxford University Press, Oxford. Cited by: §3.2. M. Paty (1993) Einstein philosophe : la physique comme pratique philosophique. Presses universitaires de France, Paris. Cited by: footnote 1, footnote 54. W. Pauli (1958) The Theory of Relativity. Pergamon, Oxford. Cited by: footnote 1. M. Planck (1906) Die Kaufmannschen Messungen der Ablenkbarkeit der ß-Strahlen in ihrer Bedeutung für die Dynamik der Elektronen. Physikalische Zeitschrift 7, pp. 753–759. Cited by: footnote 63. M. Planck (1910a) Acht Vorlesungen über theoretische Physik. Hirzel, Leipzig. Cited by: §3.1. M. Planck (1910b) Die Stellung der neueren Physik zur mechanischen Naturanschauung. Physikalische Zeitschrift 11, pp. 922–932. Cited by: footnote 23. H. Poincaré (1898) La mesure du temps. Revue de métaphysique et de morale 6, pp. 1–13. External Links: Link Cited by: §2.5. H. Poincaré (1904) L’état actuel et l’avenir de la physique mathématique. Bulletin des sciences mathématiques 28, pp. 302–324. External Links: Link Cited by: §2.5, footnote 39. H. Poincaré (1906) Sur la dynamique de l’électron. Rendiconti del circolo matematico di Palermo 21, pp. 129–176. External Links: Link Cited by: §2.2. H. Poincaré (1910a) Die neue Mechanik. Himmel und Erde 23, pp. 97–116. External Links: Link Cited by: §2.2. H. Poincaré (1910b) La mécanique nouvelle. See Sechs Vorträge über ausgewählte Gegenstände aus der reinen Mathematik und mathematischen Physik, Poincaré , pp. 51–58. External Links: Link Cited by: §2.2. H. Poincaré (1910c) Sechs Vorträge über ausgewählte Gegenstände aus der reinen Mathematik und mathematischen Physik. Teubner, Leipzig/Berlin. External Links: Link Cited by: H. Poincaré (1910b). H. Poincaré (1912) L’espace et le temps. Scientia (Rivista di Scienza) 12 (25), pp. 159–170. External Links: Link Cited by: §2.2. H. Poincaré (1953) Les limites de la loi de Newton. Bulletin astronomique 17 (3), pp. 121–269. External Links: Link Cited by: footnote 34. L. Pyenson (1985) The Young Einstein: The Advent of Relativity. Adam Hilger, Bristol. Cited by: §1, Introduction, footnote 5, footnote 57, footnote 7, footnote 77. L. Pyenson (1987) The relativity revolution in Germany. See The Comparative Reception of Relativity, Glick , pp. 59–111. Cited by: Introduction, footnote 1. C. Reid and H. Weyl (1970) Hilbert. Springer-Verlag, Berlin. Cited by: footnote 73. D. E. Rowe and J. McCleary (Eds.) (1989) The History of Modern Mathematics, Volume 2, Institutions and Applications. Academic Press, New York. Cited by: R. Tobies (1989). D. E. Rowe (1986) David Hilbert on Poincaré, Klein, and the world of mathematics. Mathematical Intelligencer 8, pp. 75–77. Cited by: footnote 78. D. E. Rowe (1995) The Hilbert Problems and the mathematics of a new century. Preprint–Reihe des Fachbereichs Mathematik 1. Cited by: §3.2, §3.2. L. Rüdenberg and H. Zassenhaus (Eds.) (1973) Hermann Minkowski: Briefe an David Hilbert. Springer-Verlag, Berlin. Cited by: footnote 32. P. A. Schilpp (Ed.) (1949) Albert Einstein: Philosopher-Scientist. The Library of Living Philosophers, Evanston, Ill.. Cited by: A. Sommerfeld (1949). C. Seelig (1956) Albert Einstein: A Documentary Biography. Staples, London. Cited by: footnote 10. L. Silberstein (1914) The Theory of Relativity. Macmillan, London. External Links: Link Cited by: footnote 56. A. Sommerfeld (Ed.) (1903) Encyklopädie der mathematischen Wissenschaften mit Einschluss ihrer Anwendungen V, Physik, Volume 1. Teubner, Leipzig. External Links: Link Cited by: H. Minkowski (1907b). A. Sommerfeld (1907a) Ein Einwand gegen die Relativtheorie der Elektrodynamik und seine Beseitigung. Verhandlungen der Gesellschaft deutscher Naturforscher und Ärzte 79, pp. 36–37. Cited by: §3.1. A. Sommerfeld (1907b) Zur Diskussion über die Elektronentheorie. Sitzungsberichte der Königlich Bayerischen Akademie der Wissenschaften, mathematisch-physikalische Klasse 37, pp. 281. Cited by: §3.1. A. Sommerfeld (1909a) Minkowski, Die Grundgleichungen.. (1908). Raum und Zeit (1909). Beiblätter zu den Annalen der Physik 33, pp. 809–817. Cited by: §3.1, §3.1, footnote 67. A. Sommerfeld (1909b) Über die Zusammensetzung der Geschwindigkeiten in der Relativtheorie. Physikalische Zeitschrift 10, pp. 826–829. Cited by: §3.1, footnote 67. A. Sommerfeld (1910a) Zur Relativitätstheorie, I: Vierdimensionale Vektoralgebra. Annalen der Physik 337, pp. 749–776. Cited by: §3.1, §3.1. A. Sommerfeld (1910b) Zur Relativitätstheorie, II: Vierdimensionale Vektoranalysis. Annalen der Physik 338, pp. 649–689. Cited by: footnote 70. A. Sommerfeld (1911) Das Plancksche Wirkungsquantum und seine allgemeine Bedeutung für die Molekularphysik. Physikalische Zeitschrift 12, pp. 1057–1069. Cited by: §3.1. A. Sommerfeld (1922) Atombau und Spektrallinien. Vieweg, Braunschweig. Cited by: footnote 72. A. Sommerfeld (1949) To Albert Einstein’s seventieth birthday. See Albert Einstein: Philosopher-Scientist, Schilpp , The Library of Living Philosophers, Vol. 7, pp. 99–105. Cited by: footnote 26. J. Stachel, D. C. Cassidy, J. Renn, and R. Schulmann (Eds.) (1989a) The Collected Papers of Albert Einstein, Volume 2, The Swiss Years: Writings, 1900–1909. Princeton University Press, Princeton. External Links: Link Cited by: footnote 55, J. J. Stachel, D. C. Cassidy, J. Renn, and R. Schulmann (1989b). J. J. Stachel, D. C. Cassidy, J. Renn, and R. Schulmann (1989b) Einstein and Laub on the electrodynamics of moving media. See The Collected Papers of Albert Einstein, Volume 2, The Swiss Years: Writings, 1900–1909, Stachel et al. , pp. 503–507. External Links: Link Cited by: footnote 68. J. J. Stachel (1989) The rigidly rotating disk as the “missing link” in the history of general relativity. See Einstein and the History of General Relativity, Howard and Stachel , Einstein Studies, Vol. 1, pp. 48–62. Cited by: §3.2. J. J. Stachel (1995) History of relativity. See Twentieth Century Physics, Brown et al. , pp. 249–356. Cited by: §3.2. R. Stichweh (1984) Zur Entstehung des modernen Systems wissenschaftlicher Disziplinen: Physik in Deutschland 1740–1890. Suhrkamp, Frankfurt am Main. Cited by: footnote 26. R. Tobies (1989) On the contribution of mathematical societies to promoting applications of mathematics in Germany. See The History of Modern Mathematics, Volume 2, Institutions and Applications, Rowe and McCleary , pp. 223–248. Cited by: footnote 76. W. Voigt (1887) Ueber das Doppler’sche Princip. Nachrichten von der königliche Gesellschaft der Wissenschaften und der Georg-August-Universität zu Göttingen, pp. 41–51. External Links: Link Cited by: §2.3. W. Voigt (1915) Über das Doppler’sche Prinzips. Physikalische Zeitschrift 16, pp. 381–386. Cited by: footnote 41. P. Volkmann (1910) Erkenntnistheoretische Grundzüge der Naturwissenschaften. Teubner, Leipzig & Berlin. Cited by: footnote 28. V. Volterra (1912) Sur quelques progrès récents de la physique mathématique. See Lectures Delivered at the Celebration of the 20th Anniversary of the Foundation of Clark University, Clark University Department of Physics , pp. 1–82. Cited by: §2.4, footnote 20. S. A. Walter (1996) Hermann Minkowski et la mathématisation de la théorie de la relativité restreinte, 1905–1915. Ph.D. Thesis, Université Paris 7, Paris. External Links: Link Cited by: §3.2, §3.2, §3, §3, footnote 58, footnote 75. S. A. Walter (1999) The non-Euclidean style of Minkowskian relativity. See The Symbolic Universe: Geometry and Physics, 1890–1930, Gray , pp. 91–127. External Links: Link Cited by: §3.1, §3.1. H. Weyl (1949) Relativity theory as a stimulus in mathematical research. Proceedings of the American Philosophical Society 93, pp. 535–541. Cited by: §3.2. E. Wiechert (1915) Die Mechanik im Rahmen der allgemeinen Physik. See Die Kultur der Gegenwart, Ihre Entwicklung und Ihre Ziele, 3, Mathematik - Naturwissenschaften - Medizin, 3, Anorganische Naturwissenschaften, 1: Physik, Hinneberg et al. , pp. 1–78. External Links: Link Cited by: footnote 28. W. Wien (1906) Über die partiellen Differential-Gleichungen der Physik. Jahresbericht der deutschen Mathematiker-Vereinigung 15, pp. 42–51. Cited by: footnote 40. W. Wien (1909) Über die Wandlung des Raum- und Zeitbegriffs in der Physik. Sitzungs-Berichte der physikalisch-medicinischen Gesellschaft zu Würzburg, pp. 29–39. Cited by: §3.1, footnote 26.